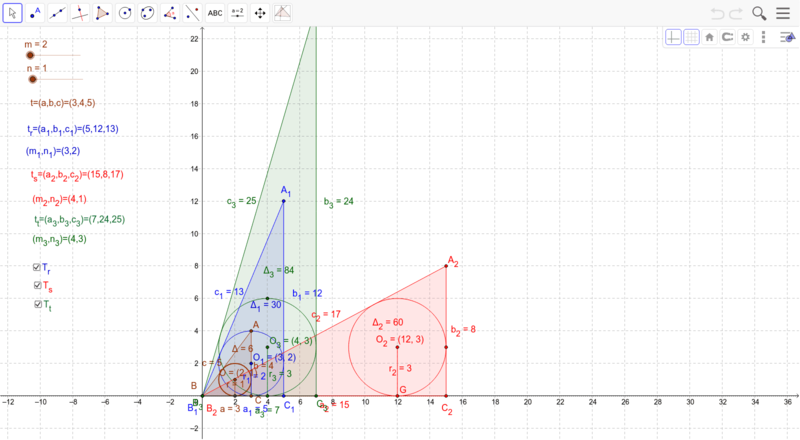 It is well known that Pythagorean triples can be generated from two positive integers m and n. Iff n<m, m and n are relatively prime and not both odd, the three numbers a=m²-n², b=2mn, and c=m²+n² form a primitive Pythagorean triple (PPT). All PPT's can be generated from the (3,4,5) triple (m=2,n=1). The three PPT generated by (3,4,5) are (5,12,13), (15,8,7) and (7,24,25). INSTRUCTION: Tick the check boxes to see the "children". Change the value of m and n (see new values generated), to generate new "children".